girl number twenty: Temporary Insanity and When Did She Turn Twelve? This is why the first thing that every person says upon entering our house is: "That's a lot of apples." Or, start drying apples. Today we dabbled in that, doing a little taste test of each variety: Mutsu (they're still in the oven! 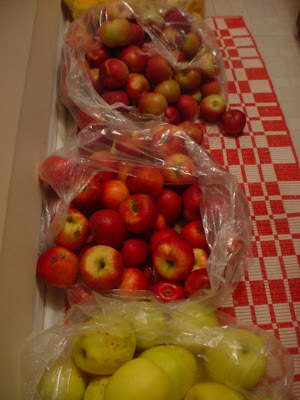 ), Courtlands, MacIntosh, Golden Delicious...they ended up very yummy, nice and crispy and sweet. Safiya's reaction as she sauntered away with her little bowl of apple chips? "Now that's a good snack!" We did canned apple pie filling and I've had a pie (Thanks Peter) every weekend since. OH, those are some of my favoritest apple varieties. When I was a girl (wow, that makes me sound either ancient or like I turned into an iguana or something), we picked apples every fall and my mom stored them in her bedroom. We used to get Mutsus so large that one and half would make a pie. And such a good pie! Macintosh are the best (in my view) apple in the world, and they don't grow them in Oregon. (Ok, one farm does, ONE!, and they are gone like "that".) And the mutsus here (when you can find them) are piddly little things, just not right AT ALL.